I create content for small business owners and solo-preneurs to better communicate their messages through social media, blog posts, articles, websites, media releases, and e-zines/newsletters. Plus I write feature articles and ghost write articles for busy people who don’t have the time or talent to do it themselves. This entry was posted in Blog, Brochures, Ghost Writing, Newsletters, Press Releases, Social Media Marketing, Web Copy on January 30, 2017 by kellykoepke. This entry was posted in Friday tip on January 27, 2017 by kellykoepke. Wanna play buzzword bingo with many of these business jargon words? Come to the WriterGals – 50 Communication Hacks event on 2/3. This entry was posted in Uncategorized on January 26, 2017 by kellykoepke. A chuckle for your Wednesday. It’s funny because it’s true. 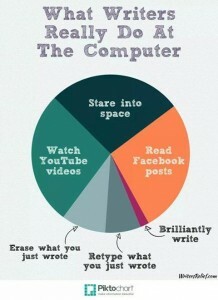 This is exactly what writers do at our computers. This entry was posted in Uncategorized on January 25, 2017 by kellykoepke. This entry was posted in Uncategorized on January 24, 2017 by kellykoepke. Come see me and 11 other dynamic, interesting and smart women present 50 Communication Hacks on February 2. We, the WriterGals, guarantee at least 50 tips, tricks and tidbits to improve your website, blog, social media, branding and general communication. This entry was posted in Blog, Brochures, Ghost Writing, Newsletters, Press Releases, Social Media Marketing, Web Copy on January 23, 2017 by kellykoepke. This entry was posted in Friday tip on January 20, 2017 by kellykoepke. Looking for something short to read? I’m surprised how many of these I’ve read. I don’t typically go for shorter novels. This entry was posted in Uncategorized on January 19, 2017 by kellykoepke. Sometimes you just want to escape. That’s what books do for me. What do they do for you? This entry was posted in books on January 18, 2017 by kellykoepke. This entry was posted in Uncategorized on January 17, 2017 by kellykoepke.